A rendering shows how a renovated Miller Park could appear. Chattanooga is almost ready to recreate Miller Park. This summer, work will begin to raise the sunken park up to street level as part of a $10 million public and private sector partnership to revitalize the area — a project Mayor Andy Berke said is a key element to transforming downtown Chattanooga. POLL: Should the city renovate Miller Park? Berke said he considers the comprehensive makeover a "once-in-a-generation investment" in Chattanooga's future. "As our city grows, we need great public spaces to serve our residents," Berke said during his recent "State of the City" address. The central feature of the new park will be an open lawn, which would eliminate the current water feature. Other key amenities include an amphitheater, a garden walk and a cafe pavilion. Once elevated to street level, Miller Park will offer more space for people to use than the current 40-year-old park, currently dominated by a fountain and pool that take up about one third of its area, said Jenny Park, strategic capital planner for Chattanooga. The new park is expected to open in spring 2017 and represents about 65 percent, or $6.5 million, of the MLK district makeover cost, Park said. The city is allocating $2.8 million to the overall park project, which would potentially call for more than 70 percent of the funding to come from private sources. Park said the city is having conversations with possible donors. If all goes according to what Park described as "an aggressive timeline," the entire MLK district makeover will be completed by the end of 2018. The new park aims to address concerns of downtown residents who say they are "eager for a more visible spot," she said. Female runners have said they will not enter the park at night, sticking to the bordering sidewalks instead, Park said. Increasing the park's use and flexibility fits in with the overarching goal for the district, which is to bring people together and provide quality public space, she said. "They want a place to relax during their normal work and life activities," she said. "They want a place to walk their dog. They want grass." Kim White, president of downtown development agency River City Co., which owns nearby Miller Plaza, could not agree more. While imaginative public spaces often serve as a magnet for private enterprise, Chattanooga actually needs to revamp its public spaces to support an already thriving Innovation District, White said. Currently, there are 2,000 downtown rental units under construction, plus another 1,300 beds for UTC students, she said. In 2017, the downtown population is expected to be double what it was only a few years ago, Park said. The Miller Park renovations are not intended to push away the homeless and Patten Tower residents who congregate there, she said. "The idea is to get more people in the park, from all walks of life," Park said. From an economic development standpoint, a downtown that is active at night and on the weekends will provide the kind of environment needed for businesses that might not thrive on weekday traffic alone, she said. The Miller Park renovation dovetails with other planned improvements for M.L. King Boulevard, Patten Parkway and Miller Plaza. "MLK Boulevard is the front door to our city," Berke said. "Every day, 40,000 people drive through it." 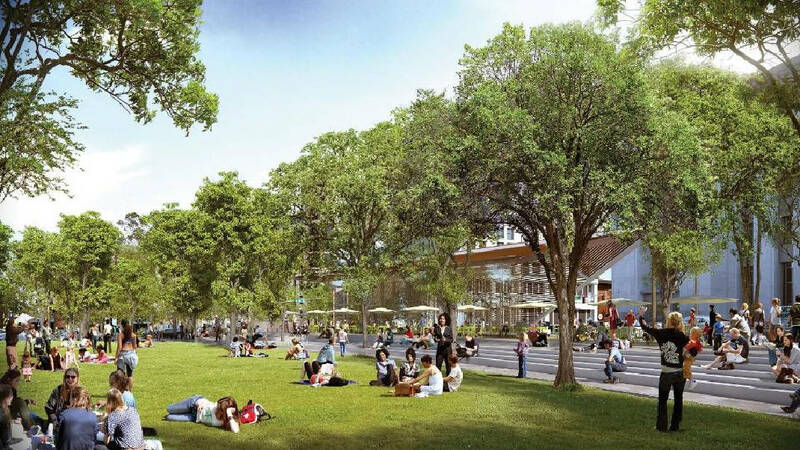 Future phases of the district renovations call for adding trees and special paving to MLK Boulevard, creating a pedestrian-friendly connection between Miller Park and Miller Plaza. That connection is essential for creating a downtown music festival since the new Miller Park is designed for special programming and Miller Plaza already hosts the free Nightfall live music series, Park said. Proposed changes for Patten Parkway call for leveling the parkway with the median, which is currently raised above street elevation. An existing tree and World War II monument will be incorporated into a new central terrace that will allow for flexible seating and market space. The pedestrian street areas "are the biggest piece" of the whole revitalization concept, White said. "They will serve as the catalyst for the activity we want to see at Miller Park," she said. "They will bring in the entire community." The MLK Boulevard and Patten Parkway designs are 60 percent complete, Park said. Conceptual plans for Miller Plaza call for removing the site's water feature to improve pedestrian circulation and widening the entrance to make a better connection to the Miller Park entrance. Combined, all these changes will "transform this underutilized area into a beautiful gateway to our city," Berke said. Contact staff writer Paul Leach at 423-757-6481 or pleach@timesfreepress.com.